With Readly you can read The Royals Magical Year and thousands of other magazines on your tablet and smartphone. Get access to all with just one subscription. New releases and back issues – all included. With weddings, new babies, christenings and a calendar of special anniversaries and birthdays, as well as a raft of national commemorations, there can be no doubt that 2018 has been a magical year for the British royal family. To celebrate, we have gathered together these incredible events in a special 116-page souvenir issue with spectacular colour photography throughout, so you can relive the treasured moments forever. At the heart of this remarkable family dynasty, Her Majesty The Queen celebrated a very special anniversary of her own this year – 2018 marked the 65th anniversary of her coronation, back in 1953. This year, of course, we also had the excitement of not one but two memorable royal weddings, which took place at St George’s Chapel in Windsor. 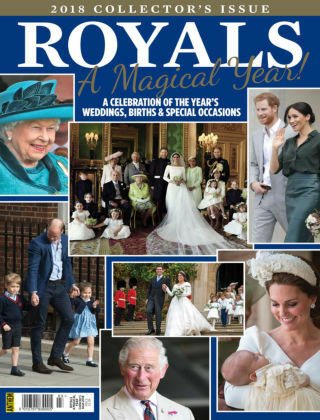 From Prince Charles’ special 70th birthday celebrations to the births of the newest royals, and from the RAF and NHS anniversaries to royal visits overseas and closer to home, you’ll find extraordinary and heart-warming stories from this truly magical royal year in our commemorative issue. We also take a look at what’s in store for 2019, (including the happy news of a first baby for the Duke and Duchess of Sussex, to whom we send our sincere and heartfelt congratulations! ).